When Iframely knows that a video auto-plays, we prevent it by putting a video placeholder with your custom "play" button inside our iFrame. We call it "click-to-play" as the actual video loads only when user requests it. You may choose "click-to-play" mode as your preference for all supported publishers. Iframely knows both regular and "autoplay" version for most popular videos sources. It will speed up your site's load time significantly and improve the user experience. On desktop, our iFrames actually start pre-fetching video when user only just starts reaching out to the play button. So in many cases, video is already available when click occurs, creating great impression. 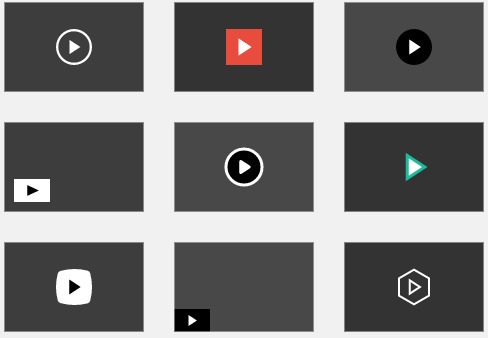 Click-to-play mode for all videos brings additional bonus of branding the "play" button your way accross most videos on your site. The player supports video files and HTTP Live Streaming (HLS). There's a link to the video source in the player, so users can check and see the original URL. Click-to-play also works with the cards. If you strictly request compact layout as your cards design, Iframely may turn on 'click-to-play' even for videos that we don't actually have an auto-playing variant. This is due to the long lasting effect of early versions of Apple's iOS, which would not start a video except as a reaction to user gesture. This started to change in iOS10. But, regardless, most publishers would not honor autoplay variants of their videos on mobile as they yet have no way to tell if it was caused by user gesture or not. There's HTML spec proposal to help with the user activation delegation. This said, we at Iframely trust click-to-play on mobile will be a reality really soon as it makes a ton of sense for everyone. Unfortunatelly, we are not quite there yet. We monitor and will add support for more providers when it becomes feasible.